We had a really great day. It started off at the orchestra hall seeing a program for kids where they played spooky songs. It was really neat and brought me back to my violin playing days. That was followed by some lunch and then home to relax a bit before the big night. 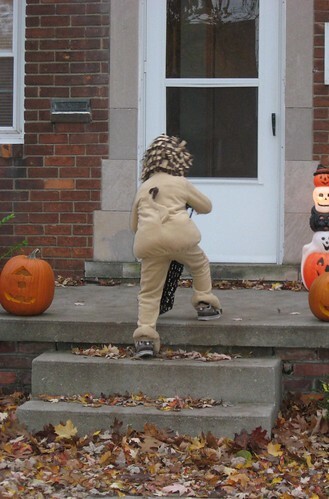 Little Man had a good time and brought home quite a bit of candy! Notes: I made a couple small changes. As i have mentioned before seaming is not my friend. 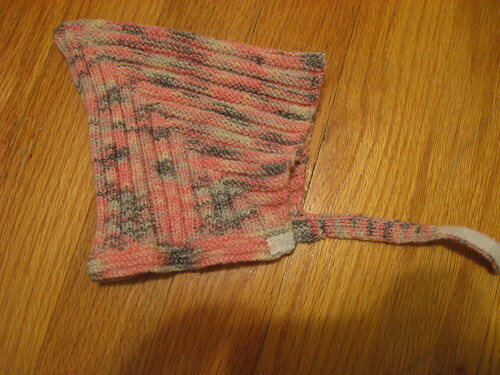 The pattern has you knit the strap separately and then sew it on. I knew of i did that i would ruin how nice the hat was looking. Trust me I would have. 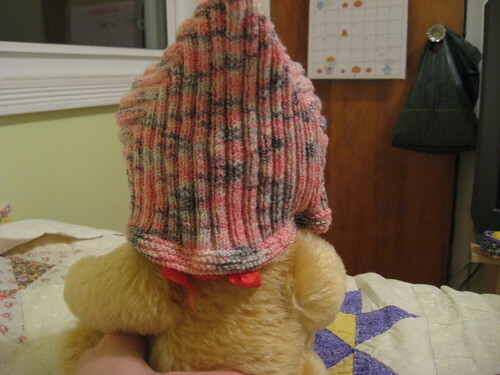 So i picked up the stitches along the bottom of the hat and knit about 8 rows. Then on the side of those 8 rows of garter stitch i picked up stitches again to knit the strap piece that would go under the chin. 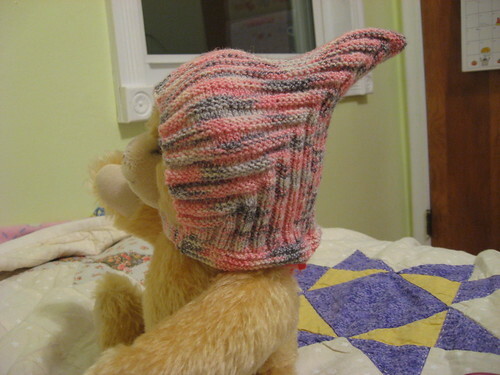 I could have cast on the extra stitches and then picked up the stitches along the bottom of the hat so the strap was done in one step instead of two. I felt doing it the way I did gave me more control over how long I was making the piece that would be going under the chin. I also went with velcro instead of the buttons. It’s adorable! I can’t wait to see it on Peyton. 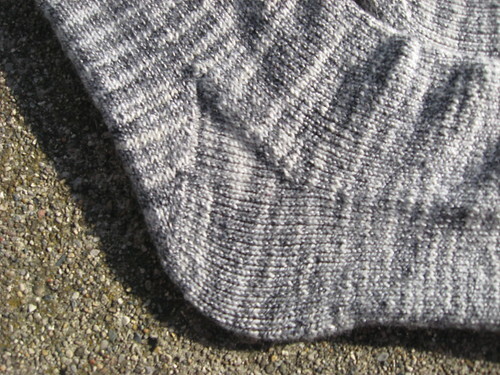 Notes: I love the heel on these socks. No picking up stitches!! The stockinette dragged on at times but i them done and hubby is very happy with them. Whew! Next up should be my mystery socks. I am very close to being done. 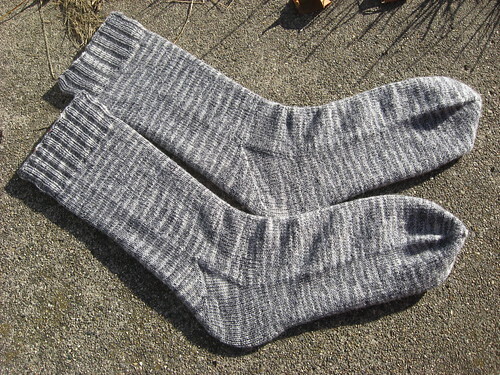 Then I want to start some socks I saw in the new Interweave Holiday Knits for my Omi. The price went up quite a bit on the magazine, i didn’t even notice until she was ringing it up, makes me thankful for 40% off Joann coupons. We had an excellent Halloween. It was warm, nearly 70, which is unusual for us. 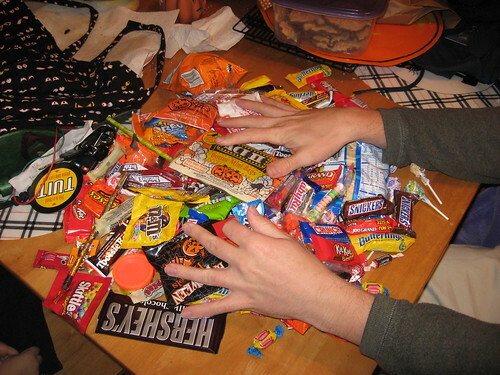 N got lots of candy and he’s been pretty good about sharing some too. 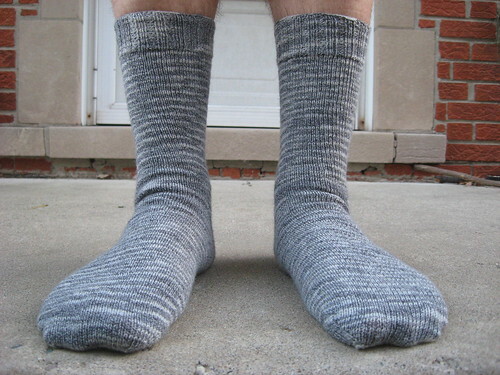 I love the look of the socks, they look so professionally made, I never reached that level with my socks. Great job!